To access your InSite instance, go to enter yourcompany.411labs.net. This URL is unique to your company and will display your corporate or Jive site logo. Your InSite instance is secured by 256-bit SSL encryption. This ensures that communication between the InSite servers and your browser are encrypted. Your username and password are for InSite only and should be unique and distinct from your Jive log on. The username and password fields are both case-sensitive. The InSite Dashboard is the default page that is displayed after you log in. 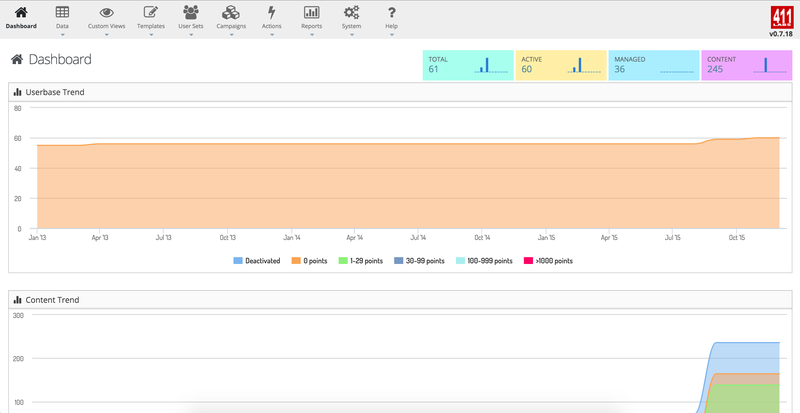 The InSite dashboard displays current high level metrics for your Jive instance, including the Userbase Trend and Content Trend graphs. The UserBase Trend graph is a stacked line graph that displays the number of users in different Jive point categories over time. The Content Trend graph is a stacked line graph of the number of content items in different categories over time. In the future, you will be able to customize the Dashboard. 2 – CREATE CUSTOM VIEW: Creates Custom View (CV) from the current screen setup. Setup includes Fields displayed; Field Order, Filter(s), and Sort(s). 3 – CREATE FROM FILTER: Creates customized user sets that from pre-defined filters. For more information, see Dynamic and Static Users Sets below. 5 – SHOW/HIDE COLUMNS: Allows you to add or remove columns from the current view. If all the columns won’t fit on the screen, a scroll bar will appear on the bottom of your browser . 6 – FILTER ROWS: Use these rows to filter your current view so that you can display your data however you want. The Filter/Sort area has two types of filter field types that work together: Match Type and String Type. Use the Match Type to select one of the drop-down selections below. Your selection works in tandem with your entry in the String Type to filter your data. For example, if you wanted to filter down to users who have “Smith” as their last name, select the “Equal” Match Type in the top row and type “Smith” in the String Type. You can filter on multiple fields at the same time. For example, you can a filter that combines Last Name is equal to “Smith” AND Location is equal to “Baltimore”. Matches RE (Regular Expression) – Looks for an exact match in the String row. 7 – SORT ROWS: Sorts the data in your current view by any column. To sort, click on any column heading (below the filter rows and above the first record row) in your current view. When you do, that column in the Sort row will turn red and the up caret will turn black signifying that your view is sorted on that field in Ascending order. Click the same column heading again and it will turn light blue, indicating the table will be sorted by that field in Descending order. To sort on multiple fields, hold down the Shift key before you select the second or third column. InSite will sort on the first column you selected, and the secondary sort will be nested into the first one. An additional function of all InSite screens is reordering the field columns. Simply click on the field name in the field header row area and drag it to the new location you would like it to appear on the screen. 8 – JIVE PROFILE LINK: Takes you to that Jive User’s Jive Profile. If you click on the Username in the table, the link will take you to that Jive User’s profile on your InSite-connected Jive site. If you are not logged in to that Jive site, you will be brought to your Jive logon screen. 9 – JIVE USER AVATAR: If you are logged into your InSite connected Jive site in a tab in the same browser as your InSite session, you will see the image of the Jive User’s avatar in this column. If you are not logged on to your Jive site you will only see the broken image link icon. 10 – JIVE USER EMAIL LINK: Opens an email to the address stored in the User’s Jive Profile. Clicking on a user’s email address will open an email to the Jive User using the default email client on your PC, Mac, or mobile device – such as Outlook or Thunderbird. 11 – EDIT ROW ICON: Sets the Jive user to be an InSite Campaign Approver or not. Please note that clicking on this icon does not allow you to edit the user’s Jive Profile. You will see only one field that can be changed – the Campaign Approver checkbox. If this is checked and saved, the User’s name will appear in the Approver/Sender dropdown list when you are creating a new Direct Message (DM) Campaign. 12 – TOTAL RESULTS AREA: Shows you how many rows you are displaying per page and the total number of records based on your current Filter(s) out of the entire user list. This is actually quite powerful. To see how many total pieces of Content you have on your entire Jive site, go to the Contents screen and scroll to this area. 13 – PAGE NAVIGATION AREA: Lets you move between the current page of data, Next or Previous pages as well as First and Last pages. 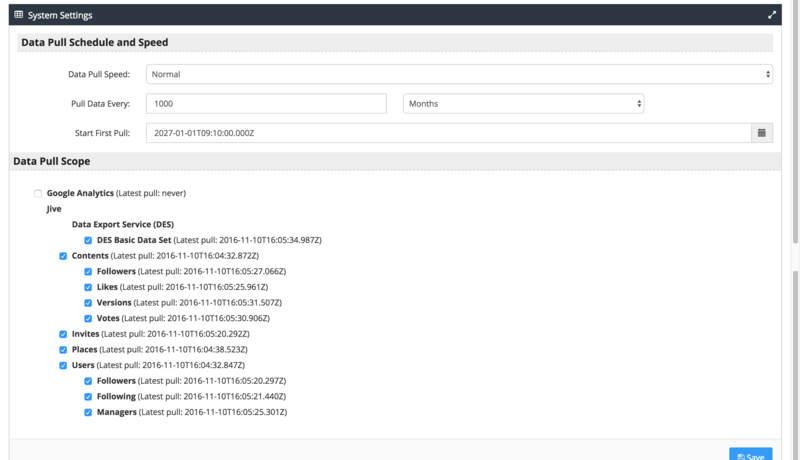 The Data menu lists the different screens that display data extracted from your Jive Instance. For a description of how to use common interface found in each of these screens, see General Screen Navigation. 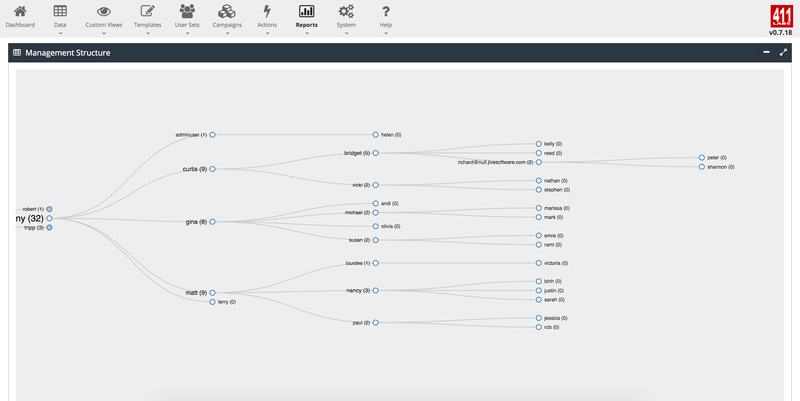 InSite displays Users, Invites, Places, and most Content from your Jive instance in fully customizable views, which can give you deep insights into the . the activity on your Jive site. The Jive Users screen can be used to create a Campaign to communicate with your Jive users and Potential Users across the entire site. This screen displays any of the Fields that you have chosen from the Jive User Profile record that are available via the Jive APIs (see Show/Hide Columns). Use the Sort Rows and Filter Rows to change the current views which then can be used to generate a Dynamic User Set or a Static User Set. 1Username is a linked field. Clicking on it will take the InSite user to the Jive User’s Jive Profile page. 2Email is a linked field. Clicking on the link will start an email to the User in the To: field. 4InSite fields only – Not in Jive Database. When an Invite Campaign Action is created – either an Invite to join your Jive community, or a Place Invite Action to existing Users – the Campaign Action injects the Invites into Jive. Jive treats these Invites as if they were sent directly from within the Jive platform itself. The Invites screen displays the status of Invites originating from an InSite Campaign. Use the data from these Campaigns to determine which ones are more successful bringing users into your Jive instance or Jive place. In this way, you can continually refine your Campaigns to maximize join rates for your Jive Instance. 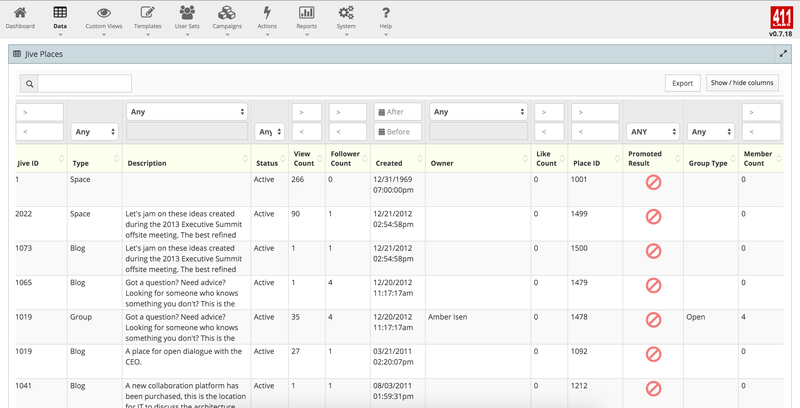 The Places screen displays the data stored for each Space, Sub-Space and Social Group in your Jive instance. As with all other InSite data screens you can filter and sort the display of your Jive Place data. In the future, the Jive Places screen will also display data for Jive Projects and Blogs. 1Display Name is a linked field. Clicking on the link will an InSite user to that Place’s Overview or Activities Page in your Jive Instance. The All Content screen displays the data stored for all content in your Jive instance – regardless of content type. 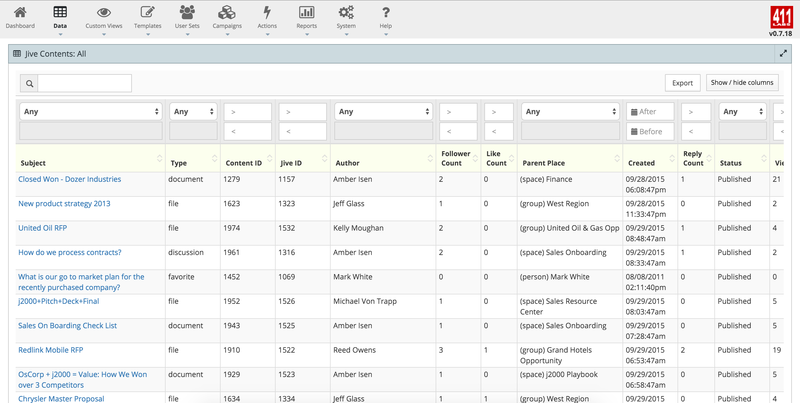 As with all other Jive data screens you can filter and sort the display of your Jive Content data. The data in the All Contents view cannot currently be used to start a Campaign. The remaining Jive Content screens (see list below) are identical to the All Content screen except they filter the content to the type that you select from the menu. Alternatively, you can use use the filter rows in the All Content screen to achieve the same effect. For example, the Documents Data screen will display the same data as if you filtered the All Content by applying the filter EQUALS and the string type “document” to the Type column. For a description of how to use the common interface found in these screens, including Sorting and Filtering, see General Screen Navigation. The Custom Views menu allows you to create, clone, edit and manage your written Custom Views (CVs). CVs are InSite queries that are more complex and robust than our regular Jive data screens and allow you to create and save queries that use more than one Jive table or even multiple data sources. Saved CVs can be saved, re-executed in the background and exported from Insite in a variety of formats. This screen displays all your existing Custom Views, allowing you to review/edit, copy, re-execute, delete, and view the resulting reports from your CVs using a single interface. As with all other InSite screens you can search, filter, sort, export as well as other actions from this screen. Disable Stage – To temporarily deactivate a Stage, click on the checkmark to the left of the trashcan icon in the upper right corner of the Stage you wish to disable. This is very useful when trying to debug a complex Custom View, since you don’t need to delete a Stage to determine if it is the source of a problem. you can deactivate it and then re-enable it to see if there is any effect on CV error messages you have been getting or changes to the Preview CV Report results at the bottom left of the Edit CV screen. Delete Stage – You can delete a Stage by clicking on the trashcan icon in the upper right corner of the Stage you are working on. This cannot be undone, You will have to add the Stage back, move it to the proper place in the overall CV and edit the Stage parameters in order to restore it. As a safety measure you should get into the habit of disabling a Stage to see if removing it will have the desired effect – before you delete it. Moving a Stage – You can easily reorder Stages simply by clicking in the Header/Title area of the Stage and moving it up or down in the Custom View you are creating/editing. Give your CV a meaningful name that will help you to separate it from another, similar CV when you need to find it again in 6 months. The description is a long text field where you can and should provide a more detailed description of the purpose and use of the CV. We also recommend using the Description field to provide some help text about how other users can change or update some of the parameters of the CV, such as changing the Date Range to run the CV against. 1. Campaigns Pulls data from the Campaigns list in InSite. 2. Custom Views Pulls data from the Custom Views list in InSite. 3. Data Exports Pulls data from the Data Exports list in InSite. 4. Jive Content Pulls data from the Jive Content table in InSite. 5. Jive DES Pulls data from the Jive DES table in InSite. 6. Jive Invites Pulls data from the Jive Invites table in InSite. 7. Jive Messages Pulls data from the Jive Direct Messages table in InSite. 8. Jive Places Pulls data from the Jive Places table in InSite. 9. 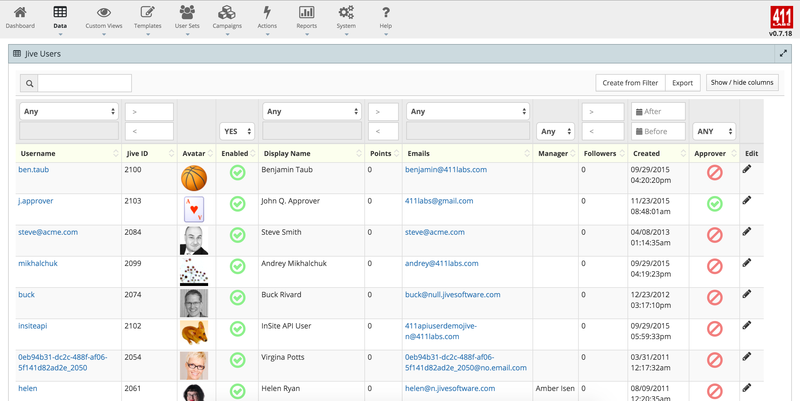 Jive Users Pulls data from the Jive Users table in InSite. 10. Logs Pulls data from the InSite log files. 11. Pulls Pulls data from the Data Pulls record list in InSite. 12. Templates Pulls data from the Templates list in InSite. 13. User Groups Sets Pulls data from the User Sets list in InSite. 14. Users Pulls data from the InSite Users list. 15. List of Existing CVs All CVs that you create will also be listed at the bottom of the drop down list and can be a data source for another CV. The Filter stage allows you to restrict the list of records displayed – based on that filter. While not a hard and fast rule, it is usually a good idea to have a Filter stage as your first stage in your CV. This generally will make your CV more efficient as following stages will just be working on the restricted number of records based on the filter. Field is a drop-down list of fields you can filter your CV query on. The list of available fields is populated once you select a Data Source in the CV Header stage. See Appendix B [Link] for a list of available fields per data source. Based on the Field you select on the left, the Filter type will automatically update. So if you pick a numerical field the Filter will switch to a greater than/less than filter. If you choose a text field, the filter will switch to a “Contains”, etc. filter with an open field for you to put your filter string in. You can filter on multiple fields within your selected Data Source. You can also do multiple filters on the same field. More than one filter on the same field behave as an AND function. InSite currently does not have an OR or other functions. To add another filter click the “+” sign on the left of the Filter Stage. Then choose your field and set up your filter for that field. The presentation Stage is the one stage in a Custom View that you can neither add nor remove. It controls how your CV data displays in the final report. The original name of your CV field. This is not editable and will always display the name of the field in the database. Also, you can click and drag in this column to reorder the display order of your fields on your final report. The name of your field as it will be displayed in the column headings in your final report. You can rename the column header labels here so that they are more understandable to someone looking at your report for the first time. As an example, you could change the default column label for Username from “Username (username)” to “Login ID”. If checked the field (column) will display in the final report. If unchecked it will not display. If checked the field (column) will searchable via the Global Search box in the final report. If unchecked it will not be searchable. If checked the field (column) will sortable in the final report. If unchecked it will not be sortable. Controls the width the column will display in the final report. Render-As controls how the data will be display in the final report. 6. Checkbox Renders boolean data (Yes, No) as a checked or unchecked box in the final report. Aggregation expressions use field path to access fields in the input documents. To specify a field path, use a string that prefixes with a dollar sign $the field name or the dotted field name, if the field is in embedded document. For example, “$user” to specify the field path for the user field or “$user.name” to specify the field path to “user.name” field. “$<field>” is equivalent to “$$CURRENT.<field>”where the CURRENT is a system variable that defaults to the root of the current object in the most stages, unless stated otherwise in specific stages. CURRENT can be rebound. Along with the CURRENT system variable, other system variables are also available for use in expressions. To use user-defined variables, use $let and $map expressions. To access variables in expressions, use a string that prefixes the variable name with $$. If the expressions are numeric or boolean literals, MongoDB treats the literals as projection flags (e.g. 1 or true to include the field), valid only in the $project stage. To avoid treating numeric or boolean literals as projection flags, use the$literal expression to wrap the numeric or boolean literals. Returns true only when all its expressions evaluate to true. Accepts any number of argument expressions. Returns true when any of its expressions evaluates to true. Accepts any number of argument expressions. Returns the boolean value that is the opposite of its argument expression. Accepts a single argument expression. Returns true if the input sets have the same distinct elements. Accepts two or more argument expressions. Returns a set with elements that appear in all of the input sets. Accepts any number of argument expressions. Returns a set with elements that appear in any of the input sets. Accepts any number of argument expressions. Returns a set with elements that appear in the first set but not in the second set; i.e. performs a relative complement of the second set relative to the first. Accepts exactly two argument expressions. Returns true if all elements of the first set appear in the second set, including when the first set equals the second set; i.e. not a strict subset. Accepts exactly two argument expressions. Returns true if any elements of a set evaluate to true; otherwise, returns false. Accepts a single argument expression. Returns true if no element of a set evaluates to false, otherwise, returns false. Accepts a single argument expression. Returns: 0 if the two values are equivalent, 1 if the first value is greater than the second, and -1 if the first value is less than the second. Returns true if the values are equivalent. Returns true if the first value is greater than the second. Returns true if the first value is greater than or equal to the second. Returns true if the first value is less than the second. Returns true if the first value is less than or equal to the second. Returns true if the values are not equivalent. Arithmetic expressions perform mathematical operations on numbers. Some arithmetic expressions can also support date arithmetic. Adds numbers to return the sum, or adds numbers and a date to return a new date. If adding numbers and a date, treats the numbers as milliseconds. Accepts any number of argument expressions, but at most, one expression can resolve to a date. Returns the result of subtracting the second value from the first. If the two values are numbers, return the difference. If the two values are dates, return the difference in milliseconds. If the two values are a date and a number in milliseconds, return the resulting date. Accepts two argument expressions. If the two values are a date and a number, specify the date argument first as it is not meaningful to subtract a date from a number. Multiplies numbers to return the product. Accepts any number of argument expressions. Returns the result of dividing the first number by the second. Accepts two argument expressions. Returns the remainder of the first number divided by the second. Accepts two argument expressions. Concatenates any number of strings. Returns a substring of a string, starting at a specified index position up to a specified length. Accepts three expressions as arguments: the first argument must resolve to a string, and the second and third arguments must resolve to integers. Converts a string to lowercase. Accepts a single argument expression. Converts a string to uppercase. Accepts a single argument expression. Performs case-insensitive string comparison and returns: 0 if two strings are equivalent, 1 if the first string is greater than the second, and -1 if the first string is less than the second. Returns the number of elements in the array. Accepts a single expression as argument. Applies a subexpression to each element of an array and returns the array of resulting values in order. Accepts named parameters. Return a value without parsing. Use for values that the aggregation pipeline may interpret as an expression. For example, use a$literal expression to a string that starts with a $ to avoid parsing as a field path. Returns the day of the year for a date as a number between 1 and 366 (leap year). Returns the year for a date as a number (e.g. 2014). Returns the month for a date as a number between 1 (January) and 12 (December). Returns the week number for a date as a number between 0 (the partial week that precedes the first Sunday of the year) and 53 (leap year). Returns the hour for a date as a number between 0 and 23. Returns the minute for a date as a number between 0 and 59. Returns the seconds for a date as a number between 0 and 60 (leap seconds). Returns the milliseconds of a date as a number between 0 and 999. Returns the date as a formatted string. A ternary operator that evaluates one expression, and depending on the result, returns the value of one of the other two expressions. Accepts either three expressions in an ordered list or three named parameters. Returns either the non-null result of the first expression or the result of the second expression if the first expression results in a null result. Null result encompasses instances of undefined values or missing fields. Accepts two expressions as arguments. The result of the second expression can be null. Accumulators, available only for the $group stage, compute values by combining documents that share the same group key. Accumulators take as input a single expression, evaluating the expression once for each input document, and maintain their state for the group of documents. Returns a sum for each group. Ignores non-numeric values. Returns an average for each group. Ignores non-numeric values. 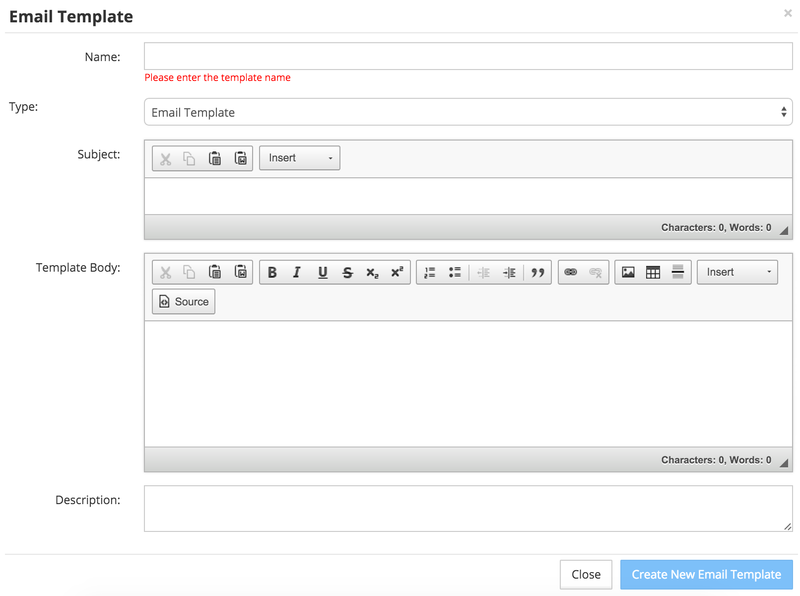 The Templates menu allows you to create, clone, edit and manage your written Templates. Templates are documents that contain boilerplate language that is used as a starting point for different Campaigns (they are similar to a mail merge document in MS Word). There are currently two different types of Templates that correspond to Campaign Types: Email-Only Templates and Direct Message Templates. When a campaign is started, InSite injects data into the template using merge fields, such as invitee name, email address, place name, etc, so that Campaign participants receive personalized messages regarding a specific action to take. This screen displays all your existing templates, regardless of type, allowing you to review/edit, copy, and delete them using a single interface. See the Action column in this screen for the icons that correspond to the above actions (for more information on how to use the filter/sort functionality found in this screen, see General Screen Navigation). Note: Once a Template has been attached to a Campaign – it can no longer be edited or deleted – only cloned. Email-Only Templates: Email-Only Templates are used to communicate directly with Jive users via email. When using these templates in an Email-Only Campaign, the emails are sent from the corporate email address that is set up in Jive’s System/Settings/Email configuration page. Direct Message (DM) Templates: Direct Message templates are used with Direct Message Campaigns to communicate directly with existing users on your site via DMs. Type: This drop-down menu allows you to change the type of Template you are creating. You can change the template type at a later date. Name: Give the template a name to help remind you of its purpose and when/how often it will be used. Tip: Use a standard naming convention such to help you sort through dozens of Templates week or months after the: This is the Subject line of the Direct Message (DM), Invite or Email-Only Template that you want users or potential users to see in the subject field. Please note the Insert button (described below) allows you to insert merge fields into the Subject. Template Body: Use this field to compose the body of the message and insert merge fields where appropriate. NOTE: DMs are limited within Jive to 255 characters, including HTML such as image links. If you are using non-western languages such as Chinese or Japanese the character count is cut in half – to 127 characters. To assist you with composing DMs within the limit, the New/Edit Template pop-up keeps a running count of characters in the lower right of the Subject and Body fields. If you find that all or part of a Campaign fails when launched, check the character count in the template. When the Merge Fields are replaced with live data, the combined character count for individual DMs in a Campaign may be over the threshold. The section below describes the basic commands and functions available within template fields; however some commands may not be available depending on the specific template you are creating. Cloning an Existing Template is an easy way to create a new template if you plan modifying an existing template for your new Campaign. To Clone a template, find the template you want to clone from the All Template Screen and select the Clone icon from the Action Column (the icon is two pages next to each other). This will bring up the Clone Template pop-up which will allow you to view/change the Template Fields. The User Sets menu allows you to create, clone, edit, and manage your User Sets. 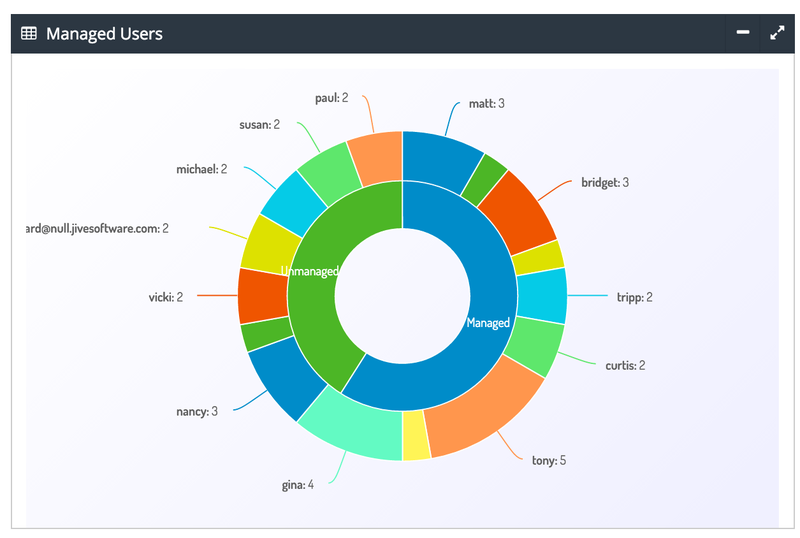 A User Set a collection of Jive Users or Prospective Users. Currently, only Dynamic Users Sets are available, however, future releases will include other types of User Sets, including Static and Prospective User Sets. When used with a Campaign, a User Set provides the list of Participants to the Campaign while the Template provides the message to those participants. A Dynamic User Set (DUS) is a pre-defined query or filter (or set of filters) that can be reused over and over again. It is not a list of names, but a stored set of rules to generate a new list of Participants whenever the Dynamic User Set is executed. A good example of how to use Dynamic User Sets is welcoming new users to your Jive site. First, you would create a Dynamic User Set based on a filter that is applied to the field “Created” for a specific time frame, such as the previous week (Tip: Remember to use a clear naming convention when saving your User Sets, such as “New Users from DATE to DATE”). Next, you would create both a Direct Message Template and a Direct Message Campaign that uses this template to send a welcome message to the User Set you just created (see Templates and Campaigns for more information). In this way, you can continue to build and deploy new User Sets and Campaigns to welcome each cohort of users that join your sites. For more information on how to create a new User Set, see below. The All User Sets screen displays a list of your User Sets that you have and saved in InSite. You can sort and filter your User Sets, just as you can other screens with tabular data within InSite (for more information on how to use the filter/sort functionality, see General Screen Navigation). Currently, only Dynamic User Sets are supported. 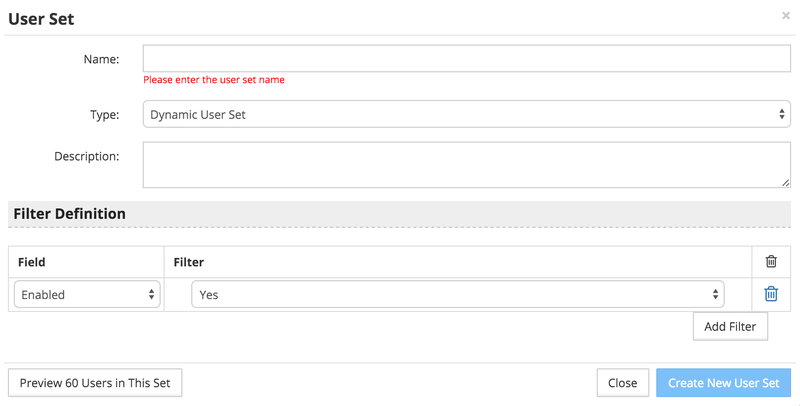 To create a new Dynamic User Set, select New Dynamic User Set from the User Set Menu. Next, complete the Dynamic User Set Fields in the pop-up below using the guidance text below. Name: Give the User Set a name that will help remind you about its purpose and when/how often it will be used. Tip: Use a standard naming convention to help you quickly identify the User Set you are looking for at a later date. Type: This field defaults to the new User Set you selected from the User Set Menu. Once additional User Sets become available, you will be able to change the type using the drop-down in this field. Description: Use this field to clearly describe the purpose, audience, and intent of your User Set. The description of the example Dynamic User Set described in the above section might read: “User Set created to capture new users who have joined the site from [DATE] to [DATE]. Filter Definition: The Filter Definition field is where you define the Filter (or Query) InSite should use to create your Dynamic User Set. Please see the next section about how to create and apply filter criteria to your User Set. *InSite fields only – Not in Jive Database. You can add one or more filters to your User Set by clicking on the “Add Filter” button at the bottom of the “New Dynamic User Set” pop-up screen. You will notice that the list of Jive user fields available below to Filter a Dynamic User Set is the same as the list found in the Data Menu section of this document. Under the Field heading, select a Filter Field from the dropdowns. Under the Filter heading, select a Filter Type from the dropdown. You will notice that InSite automatically displays the structure of the Filter for you. For example, if you selected “Given Name” from the Filter dropdown, you will have the following selections for the filter type: : Contains, Starts With, Ends With, or Matches Regular Expression. In the next box, enter a Filter Value that you would like to filter on. For example, to create a filter for all users that have the last name “Smith,” you would need to select “Equals” as a Filter Type and “Smith” as a Filter Value. You can continue to add additional Filters to the New Dynamic User Set until you are satisfied that you have captured the list of Users you would like to keep. Click on the Preview Users in this Set button to view the results of your current Filter. Click on the Create New User Set button to save your Dynamic User Set. Note: You can also create a new Dynamic User Set by going to the DATA → JIVE USERS table screen and setting up your Filter on that screen. If you build your filter on that screen, simply click “Create from Filter” button in the upper right of the Jive Users Screen and select Dynamic User Set. The Campaigns menu allows you to create, clone and manage your InSite Campaigns. Campaigns are a coordinated set of communications to a specific group of Users or Potential Users that are designed to elicit an action by the recipient. Actions can include anything from joining your Jive site, completing their Jive User profile, or interacting with content and/or other users. Currently, there are two different types of InSite Campaigns: Email-Only Campaigns and Direct Message Campaigns (additional campaigns are in development). Both of these Campaigns are designed to utilize a different communication method and to reach a different type of User or Prospective User. Template: Templates are documents that contains boilerplate language and are used as a starting point for different Campaigns (they are similar to a mail merge document in MS Word). When a campaign is started, InSite injects data into the template using merge fields, such as invitee name, email address, place name, etc, so that Campaign participants receive personalized messages regarding a specific action to take. User Set: A User Set is a list of Jive Users or Prospective Users that receive a customized message (created by injecting data into merge fields in the Template) when the campaign is initiated. When you want to send a Jive link to a lot of people – even if they are not (yet) Users on your Jive site. In effect, the email message acts as an invite to your Jive site since the recipient will not be able to view the link unless they register as a new user. When you want to communicate with people who have been invited, but haven’t yet registered as a new user either because they did not open the email, click on the link, or submit their profile. Since these people are not yet Users on the Jive site, there is no easy way to communicate with them within Jive. When you want to communicate with existing users who have not logged into Jive in a while. When you want to communicate with Jive Users when your Jive instance is down. Direct Message (DM) Campaigns: Direct Message Campaigns are designed to communicate with a specific User Set inside Jive. These User Sets can be vertical (e.g. all the members of a specific Social Group) or horizontal (e.g. all the Users who have been on your site for more than 6 months, or who all have a specific word in their Profile, or are the owners of certain content on your Jive instance). DM Campaigns are part of the core functionality of InSite, giving you the ability to communicate with any set of your existing Jive Users – as long as they share a common characteristic in the User Profile. The All Campaigns screen displays a list of your Campaigns that you have saved in InSite. You can sort and filter your Campaigns, just as you can other screens of tabular data within InSite (for more information on how to use the filter/sort functionality, see General Screen Navigation). Cloning an Existing Campaign is an easy way to create a new campaign if you plan to use an existing Template and/or User Set for your new Campaign. To Clone a campaign, find the campaign you want to clone from the All Campaigns Screen and select the Clone icon from the Action Column (the icon is two pages next to each other). This will bring up the Clone Campaign pop-up which will allow you to view/change the Campaign Fields (see below) for your new Campaign. You will need to change the name of the Cloned Campaign before saving. If you Clone a campaign that has already been started, you will not be able to edit the Template of the newly-created campaign (this rule prevents Templates of completed campaigns from being altered). In this case, you should Clone and rename the Template first, then Create a New Campaign, selecting the new template in the New Campaign pop-up (see below). Currently, only Email and Direct Message Campaigns are supported. To create a new Campaign, select the Campaign Type from the Campaign Menu. Important Note: When creating a new campaign, you should have also have your User Set and Template ready to go. For more information, See Creating a New User Set and Creating a New Template / Cloning a New Template. Complete the Campaign Fields in the pop-up below using the guidance text below. Note: The letters immediately after the field name correspond to the type of Campaign that the field appears on: E=Email, DM=Direct Message. Name (E, DM): Just the name you give your Campaign. Just make it something that is unique and will help you remember what the Campaign was about if you are looking it up a year from now. Template (E, DM): Use this drop-down to select the Template to use with this Campaign. The Template must have already been created in order to be selected here. See the TEMPLATES section of this document for more info on Templates. User Set (E, DM): Use this drop-down to select the User Set to use with this Campaign. The User Set must have already been created in order to be selected here. Go to the USER SET section of this document for more information on the different types of User Sets and how to create or edit them. Description (E, DM): Use this field to clearly describe the purpose, audience, and intent of your Campaign.. The Description field is shown in the All Campaigns view, and can help you distinguish from among several similarly named Campaigns. Send From (DM): The Send From or Campaign Approver (CA) field in a Campaign was developed based on an understanding that the sender of a message is a major factor in determining whether that message is opened and/or read. Many users will be more likely to open a message from someone in their community of practice/office/team than if it was sent by the Community Manager. Therefore, this field allows you to specify a User’s name from whose account the direct message will be sent out (the message will only be sent after it is approved by that user). When you click on the drop-down, you will notice that it does not list all Users – only some of them. In order to allow a User to appear in the drop-down, they need to be designated as a Send From/Approver in InSite. Designating a Send From/Campaign Approver: To designate someone as a Send From/Campaign Approver, go to the Data –>Jive Users screen and then make sure that the Edit column is displayed. See the DATA MENU section for more info on displaying columns.Find the specific User you want to be the Send From/ Approver and then click the Edit icon (pencil) in the row for that User. This will bring up a pop-up that only has one option currently – a check box next to Approver. Check the box and click the Save button. This User will now appear in the Send From/Approver drop-down in the New/Edit Campaign screen. Once you have specified all the components of a Campaign ( Template, User Set and Send From/Campaign Approver User selected), you are ready to Start your Campaign. To Start a Campaign, find the Campaign you wish to Start in the All Campaigns screen, scroll over to the Action column and click on the Start icon (play image). If you are starting an Email Campaign, InSite will prompt you to confirm your selection. If you select, “Yes” the Campaign will be started and the recipients in your User Set will begin receiving emails based on your Email Template. If you are Starting a Direct Message Campaign, InSite will send a DM to the Send From/Campaign Approver with a link this will send an InSite-specific DM to the Send From/Approver with an Approval Link in it. When the Send From/Approver receives and opens the link in the DM, they will be taken a special InSite screen in which they can Review, Approve/Disapprove and Start the Campaign. From the Review/Approval screen, the Send From/Approver can review all of the components of the Campaign, including the Template and the list of participants in the User Set that the message will be sent to. If the Send From/Approver is satisfied with the Template and the User Set, they can Approve the Campaign and execute it by entering their Jive credentials into the User ID (pre-filled) and Password fields provided at the bottom of the page, and then click the Approve button. Important Note: InSite only stores the Campaign Approver’s credentials long enough to send the messages to the participant list. Once the Campaign has been completed, the credentials are deleted from InSite. Once a Campaign has been approved, InSite immediately begins to inject the message into your Jive instance and it will appear in the Jive inbox of the recipients. The InSite Reports menu allows you to view your system Reports and Graphs. Currently there are four Reports available in InSite (in addition to the Dashboard reports): Management, Content, Places and Influencer Reports. Each of these reports, described below, shed light on different aspects of what is happening on your Jive instance. The Management Report displays the relationship between users who are managers and other users who are their direct reports. It is another visual representation of the Organizational Chart contained in Jive. Click on each of the nodes in the Management report to collapse the direct reports for that individual. Clicking on the node again will expand the selection. The Content Report displays a data visualization of Content Popularity by Views, Likes or Followers. This visualization, called an area map, organizes Views/Likes/Followers categorically by color and size, allowing you to quickly gauge the most popular Jive objects. Each content type is represented by a different color. The size of each rectangle is in direct proportion to the number of Views/Likes/Followers the content items has relative to other content on your site. To toggle between Views/Likes/Followers, click one of the radio buttons in the upper right of the screen. To view the exact number of Views/Likes/Followers, simply click on an individual box within the chart and a popup will appear with the details. The Places Report is very similar to the Content report, except the visualization shows the Views or Followers for Jive Places (Spaces, Social Groups, Projects, and Blogs). The colors represent those four Place types. To toggle between Views/Followers, click the appropriate radio button in the upper right of the screen. The InSite System Menu allows you to change InSite parameters, pull interim data from your Jive instance and add or change your list of InSite Users. The Settings Submenu contains the following screens: Jive Settings, Email Settings, Campaign Approver, and Data Pull. Login: Enter the Jive User ID of the API User you created for InSite. This User must have permissions to view all Content and Places that you want to track and work with via InSite. Password: The Jive Password of the above API Jive User. In order for InSite to be able to pull data from Jive’s Data Export Service (DES), you must generate an Advanced Analytics Add-on Client ID and Secret token, using the directions in the OAuth Credentials Section of the System/Settings/Jive Screen. Once you have generated both items, simply copy them into the appropriate fields in the OAuth Credentials section of the Jive Settings Screen and click Save at the bottom of the screen. NOTE: If you make any changes to this screen, please remember to scroll to the bottom of the entire page and click the Save button. The Email Settings screen is where you define the parameters for the email server InSite will use for Email-Only Campaigns. Typically, these parameters are associated with your corporate email server and can be obtained through your company’s IT department. Tip: Copy and paste the parameters below into an email that you can send to your IT department. Server: The outgoing address of the email server InSite will be using for Email Campaigns. Port: The port on that email server that it will listen on. Secure: Whether or not that connection to the email server needs to be secure (SSL) or not. From: The email address that Email Campaigns will appear to be from. Requires Authentication: If the email server you are connecting InSite to requires authentication via a User ID and password, checking this box will make those two fields appear below the checkbox. User: The actual User ID of the email address on the email server that will send out the emails for an Email Campaign. This is usually the same as the From field above. Password: The password of the User ID on the email server. Note: This is not a Jive User ID. Test: Allows you to test if your InSite email settings are configured correctly without creating and sending a Campaign. Enter the email address of the person you would like to receive a test email sent from InSite and click Test. Once you confirm receipt of this email, make sure to click Save at the bottom of the screen to save your settings. NOTE: If you make any changes to this section, please remember to scroll to the bottom of the entire page and click the Save button. The Campaign Approver Settings Screen allows you to define the settings of the Direct Message that will be sent to a Campaign Approver when a CM launches a DM Campaign. Send approval request by email: Check this box if you wish all approval requests for a DM Campaign to be sent to the Approver via Email (note: Email-Only campaigns do not use Approvals Requests). You can also send the request by DM – see below.. Send approval request as DM: Check this box if you wish all approval requests to be sent to the Approver via Direct Message (DM) inside your Jive instance. Note: If the Approver is a Jive User and has their Profile Preferences set to deliver DMs to their email inbox, the Approver will receive the approval request in both their Jive and email inboxes. If both boxes are checked, the Approver will receive the Approval Request via both DM and email – regardless of how their Jive Profile Preferences are configured. The Approver can use the link contained in either message to launch the campaign. Below the checkboxes is the template for the Campaign Approval Request. By default, InSite includes a template with boilerplate language, which,you can edit here if you choose. The Campaign Approver Template area has two sections – the Subject line and the Body, just like other Templates in InSite. Unlike other InSite templates, this template will only be sent to the Send From/Approver that you specified in your DM Campaign. Note: Your DM Campaign will only be sent to it’s intended recipients after the Campaign Approver approves the Campaign. Important Note: The Approval Link field MUST be in the Template Body in order for the Campaign to be approved by the Approver. . The default Campaign Approver Template contains this field. If this field gets deleted, you must add it back in by selecting INSERT menu in the Template Command Bar. If you make modifications to this menu, make sure to save your settings by clicking the Save button at the bottom of the screen. NOTE: If you make any changes to the sections below, please remember to scroll to the bottom of the entire page and click the Save button. Data Pull Speed: Select Slow Medium or High – This drop down menu allows you to change the speed by which InSite pulls data from your Jive Instance. Depending on the number of users who are logged into your Jive Instance and the size of your user base, there may be an impact to performance for the logged in users. Tip: Consider observing the potential performance impact directly by browsing the site during the data pull. If there is a noticeable performance impact, try setting the Data Pull Speed to the next slowest setting. You can choose between Ridiculous, Slower, Slow, Normal, Fast, and Faster. Pull Data Every: This field allows you to specify how often the Jive data is updated. Use the first and second fields to specify the number of Hours/Days/Weeks/Months between data pulls. Tip: In general, we suggest specifying a time frame of no less than once a day, and no more than once an hour. Start First Pull: Specify the date/time (expressed as Coordinated Universal Time – UTC, which is usually the same as Greenwich Mean Time – GMT) that InSite pulls Jive data from your Jive Instance via the APIs. Note: Because the first data pull can be an enormous amount of data, it make take anywhere between 1 and 6 hours to complete..
DES (Data Export Service) – Currently the only selection under the DES is DES Basic Data Set. The Basic Data Set is a subset of the complete data available via the DES. The entire DES data set is extremely large and the Basic Data Set will give you some useful data immediately without needing to pull the entire set. The Basic Data Set includes fields such as Last Login Date – which is available via the Jive Users Screen in InSite. Select this data set by checking the box directly to the left. Note: Ensure that you have configured the OAuth Configuration Section of the Jive Configuration settings screen. Jive (Rest APIs) – This data set includes many fields associated with Jive Contents, Invites, Places and Users. You can select these data subsets by individually checking the boxes next to the data item. The Security screen is new in InSite 0.8.4. It is where the InSite Administrator (IA) can configure the security settings for all InSite users. To get to the Security screen click on the System menu icon> Then Settings> Then Security. Password Complexity Screen: The top half of the new security screen has to do with the rules InSite will enforce for creating passwords for users. Require lowercase letter – If checked, will require that there be AT LEAST one lowercase letter in the final password construction. Require uppercase letter – If checked, will require that there be AT LEAST one uppercase letter in the final password construction. Require a number – If checked, will require that there be AT LEAST one number in the final password construction. Require a special character – If checked, will require that there be AT LEAST one special character (! @#$%, etc.) in the final password construction. Require to not be the same as the login ID – If checked, will require that the password cannot be the same as the user”s user ID on InSite. So if my User ID was “btaub” my password could not be “btaub”. This option is checked by default. This setting bears some detailed explanation. These selections represent a second set of password construction gates – over and above the other settings in this section. The selection you choose here is completely independent of your other selections in this section. Each pick from the drop-down menu enforces an increasing level of complexity on password that make them harder to crack in a brute-force attack. A brute-force attack is one where the hacker has an automated tool that starts with “00000000” and then tries “00000001” and keeps going through “ZZZZZZZZZ” and then the special characters and so on. Obviously, those tools try the easiest ones first (“password”, etc. )This section uses a library that uses a combination of a dictionary of known words (e.g. “password”, “Welcome1”) and a construction algorithm that analyzes the password for things like how close the key are together on the keyboard. So, while “qwerty” is not a real word, the keys are in a row next to each other on a keyboard and could be guessed in milliseconds during a brute-force attack. So each of the five selections represent passwords construction that will each take longer to crack than the selection before it. If you pick “Too guessable” a hacker could brute-force this password in less than a second. The highest selection would take years of machine time to crack and is by far, the best protection from a brute-force attack. These passwords are usually VERY long, not real words and are essentially a string of random letters and characters. So, the intent with this selection is to slow a hacker running a brute-force attack down – giving us and you a better chance to detect the intrusion and shut it down. Again, this selection is independent of your picks on the other options above and below it. So you may create a password that has no real words, is 18 characters long and is basically a string of random letters numbers and characters – and if you have chosen the highest level of this setting – you password may still not pass this gate and you will be alerted that the password needs to be even harder to crack. So we recommend a balance of security and practicality. Depending on the sensitivity of your Jive data, you may want to choose one of the middle level for this pick. Too little security and you are asking for trouble these days. Too much and the system can become unusable. Use common sense and your organizations overall posture and policies for these things and set it up accordingly. Minimum password length – If set to anything other than 0, will enforce the rule that passwords cannot be shorter than the entered number of characters. Setting it to 0 will not enforce any minimum password length. Realistically, this should never be less that 8, and 12 is much more secure. Save after any changes to the above section. User Login and Session Section: This section lets you control other aspects of security that are not related to Password Complexity. Notify the specified InSite security administrator, via email, that a specific InSite user is locked out of their account due to exceeding the configured number of failed login attempts. Specify the email address of the InSite Security Administrator. The Pull Data Screen allows you to pull the most recent data from your Jive Instance – outside of your regularly scheduled pulls. InSite regularly polls Jive for the most recent data based on the Pull Data Every field defined above, however sometimes you need the data updated immediately. The Pull Data function allows you to force an immediate pull to update InSIte data regardless of the normal pulling intervals specified in the Settings screen. IMPORTANT NOTE: The API calls that InSite uses to both extract and inject data into and out of Jive can impact system performance if run too frequently. You should only use the Pull Data function when you have specific data that you need updated now and cannot wait until the next scheduled data pull. IMPORTANT NOTE FOR JIVE-X CUSTOMERS: Under the terms of the license agreement for Jive-X, Jive license fee charges are based on the total number of monthly page views. This is in contrast to Jive-N customers, in which Jive licence fees are calulated based on the number of registered Jive users. For Jive-X Jive “charges” 1/6 of a Pageview for every API call. Due to the way the APIs are architected the data pulls by InSite can add up to A LOT of pageviews – sometimes meeting or even exceeding user pageviews on a monthly basis. Jive provides you as a customer with a monthly report of pageviews on your Jive installation. This report issued monthly by jive shows the split between user-generated page views and API-generated page views so you will be able to see the effect of InSite API data calls on a monthly basis. The Users and Permissions Submenu contains settings related to the InSite Users and Roles Screens. The InSite Users Screen allows you to add, remove or change Users to your InSite system. Please note that the InSite Users added in this section are NOT Jive Users. Create New System User – Click on the “Create New System User” button, which will bring up the New User pop-up. Please note that all the fields are required, including a second field under Password in which you have to retype the password. The last field is the Role drop-down. For an explanation of the roles, please see the next section. Changing an InSite User’s Role – To change the Role of an existing InSite User, click on the Edit icon (pencil) at the far right “Action” column for any users listed in the table. Next, click on the Role field and select the new Role for the user. Then click the “Update User” button in the lower right of the pop-up. This Screen allows you to view the specific functions that each InSIte User Role can fulfill within InSite. Each new InSite User must be assigned a Role. By default, your initial InSite user is assigned the Role of Administrator. Each InSite instance much have at least one user with the Role of Administrator. For a complete description of the functions available for each role, see below. Note: At this time, the specific functions of each User Role are predefined and cannot be edited. Tip: While you are creating new InSite Users, open this matrix in another tab in your browser and use it as a quick reference when defining the Role for the new user. Developer – This role is reserved for InSite Support staff and allows users with this Role to perform all of the functions of the Administrator Role plus the abilities to develop the product and manage Actions. Administrator – This Role allows a user at perform all of the day-to-day management tasks for the InSite instance – including managing InSite Users and System settings and configuration parameters. The Administrator Role is the only one (other than Developer) that has access to the functions under the System menu (This menu will not display for users with any other permissions). Campaign Launcher – The Campaign Launcher Role is specifically designed to allow a user to perform all Campaign functions – including create, edit, delete and launch campaigns created by themselves or other users. This Role allows for the separation of Campaign creation and setup functions (see Campaign Creator Role) from the ability to launch those campaigns. Campaign Creator – The Campaign Creator Role is designed to allow users with this Role to create and edit unlaunched Campaigns – but not to launch them. Campaigns created by users with this Role must send a Campaign Approval Request to another user with the Role of Campaign Launcher or above to actually execute or launch the Campaign. The roles of creating and editing a Campaign has been intentionally separated from the Role of launching the Campaign. This separation acts as an additional review and approval step for Campaigns, especially ones that impact large numbers of users. Data Explorer – The Data Explorer Role is designed for an InSite User that is generally not involved in the Campaign creation or launch process, but is instead involved in the creation, edits or deletion of Custom Views, or the Reports, Charts, Graphs or Dashboards associated with the Custom Views. Data Explorers can also view the raw Jive data available under the Data menu. Report Viewer– A user with the Report Viewer Role can only view Reports, Charts, Graphs, or Dashboards created via the Custom Views functionality available to users with the Data Explorer Role or above. Report Viewers cannot see raw Jive data, nor create or edit the underlying Custom Views used to generate the Reports they have access to. Managing access to individual Reports is handled within the Custom View used to generate the Report. User – A user with the User Role in InSite cannot do anything except access functions under the Help menu within InSite. The role is here primarily so that a user can read InSite documentation and report bugs. Clicking on the Full Screen menu selection switches InSite into fullscreen mode. Press “Esc” on your keyboard to exit Full Screen mode. Use the Logout selection to log out of InSite. You should always logout of InSite when ending a session for security reasons. The Help menu allows you to review the Current InSite Documentation (this document), report a bug discovered in InSite, and view the InSite Release History. Clicking on Help under the InSite Help Menu displays the Documentation for the current release. To navigate in the Help menu displays this document. Use the sidebar on the left to browse the different help topics. Clicking on the small arrow next to a help topic will expand the subtopics available under that topic. Use the search bar at the top of the screen to search for a particular topic or Control-F in your browser to search for specific terms throughout the text. Clicking on the “Report a Bug” menu item will open a pop-up that will allow you to enter details about the bug you discovered or the issue you want to discuss with Support. Give your problem or question a title/summary subject and a more detailed description of the issue, including when and how the problem arose. Once you submit the Bug Report by clicking the button at the bottom of the form, Insite Support will be in touch (usually within one business day) with either a solution or an acknowledgement that you have found a bug and our timeframe for fixing it. New versions of InSite are released in Continuous Deployment – which means that we add features and release new versions on an ongoing basis. Please note that all InSite customers will always be on exactly the same version (or Build). The Release History can be viewed by either going to the Help tab and then clicking on the Release History menu selection, or by clicking on the version number in the top left corner of the screen – next to the InSite logo from any screen in InSite.